Science of the Saints, Deposition of the Robe of the Mother of God at Blachernae, 15-VII-2018. During the years of the reign of the Byzantine emperor Leo the Great the Macedonian (457-474), the brothers Galbius and Candidus, associates of the emperor, set out from Constantinople to Palestine to venerate at the holy places. In a small settlement near Nazareth they stopped for overnight lodging with a certain quite aged Hebrew woman. In her house the burning of candles and smoking incense caught the attention of the pilgrims. 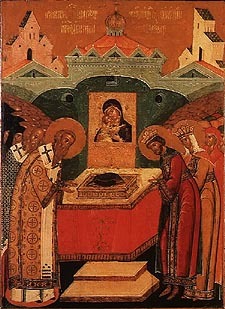 To their questions as to what sort of sacred thing there was in her house, the pious woman for a long time did not want to give an answer, but after persistent requests she replied that she had a very precious sacred item – the Robe of the Mother of God, from which had occurred many miracles and healings. The Most Holy Virgin before the time of her Dormition bequeathed one of her garments to a pious Jewish maiden from the family lineage of this house, having instructed her to hand it on after death to another virgin. Thus, from generation to generation, the Robe of the Mother of God was preserved in this family. The jewelled chest containing the sacred Robe was transferred to Constantinople. Saint Gennadios, Patriarch of Constantinople, and the emperor Leo, having learned of the sacred find, convinced themselves of the incorruptness of the holy Robe and with trembling they certified its authenticity. At Blachernae, near the seacoast, there was erected a new church in honour of the Mother of God. On 2 June 458 Saint Gennadios with appropriate solemnity transferred the sacred Robe into the Blachernae church, placing it within a new reliquary.